Inventory We are a resale marketplace, not a box office or venue. Ticket prices may exceed face value. This site is not owned by Don Haskins Center . 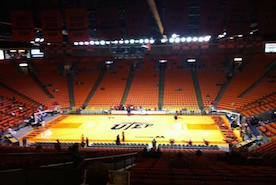 The Don Haskins Center has been home to the UTEP Miners men's and women's NCAA basketball teams since opening in 1977. Originally known as the Special Events Center it was renamed in 1998 after Hall of Fame basketball coach Don Haskins. The Don Haskins Center box office is located at 500 West University Avenue on the UTEP campus in El Paso, Texas. The arena currently has a seating capacity of 12,567 and was originally constructed for $10 million. Don Haskins Center tickets have included band like the Eagles, KISS, Britney Spears and many others. CenterElPaso.com is not affiliated with any official website, performer, venue, and or box office. We are a privately owned and operated company that concentrates in all events in the secondary resale marketplace. Prices on our sites tend to be above face value. To order tickets for all Don Haskins Center El Paso events simply follow the process online through the checkout.